Oak Island Fishing Charters would like you to send the pictures you took while on the boat with us. Almost all the pictures on the website are from the customers since I like to tear my cameras up. We have had some great pictures over the last several days with familys and I am still waiting. This morning the wind felt like it had more South than Southwest so we decided not to go to Carolina Beach this morning and just moved the trip to another day. When we make the decision to run up to CB we cant be second guessing. If we missed a good day up there today then so be it. 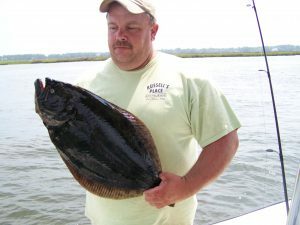 Today Oak Island Fishing Charters went back to Carolina Beach were the ocean was flat again. After about an hour we found tons of bait with Spanish Mackerel jumping everywhere but they must have been practicing because they were not biting the hooks. Several Charter boats circled the schools of fish only catching a hand full. We made a move to a spot in the river on our way home and started catching nice Spanish and Bluefish. 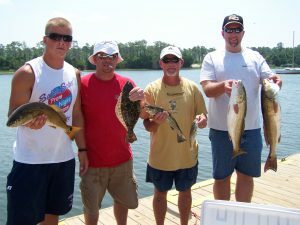 So you never know what each day brings but we caught fish, stayed in calm water and everybody was happy. Oak Island Fishing Charters ran up to Carolina Beach today to get out of the wind that was blowing at Oak Island. The ocean was so rough off Oak Island I felt like I had no business out there. Once we got to Carolina Beach the ocean was flat the Spanish Mackerel were biting steady. This is a real advantage of being on a Center Console with the speed we make, Carolina Beach is only 30 min away. 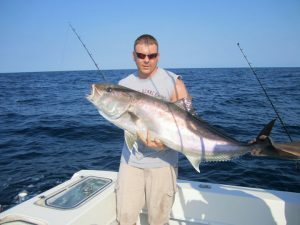 Oak Island Fishing Charters takes pride in finding you Big Fish when we go offshore. Today was no different even though the fishing was a little slow and the end of the day we had a box full. Oak Island Fishing Charters had 2 1/2 day trips catching Spanish Mackerel and Big Sharks. I left out the word fishing because when you catch fish like we did today its called catching. We found Spanish Mackerel on both trips today jumping all around us and every time all the rods would have fish on them. It does not take long to fill the cooler this way. The sharks must have goten the memo also because every 5 min we had big Blacktips on. Looks like we will be backwater fishing the next couple days. 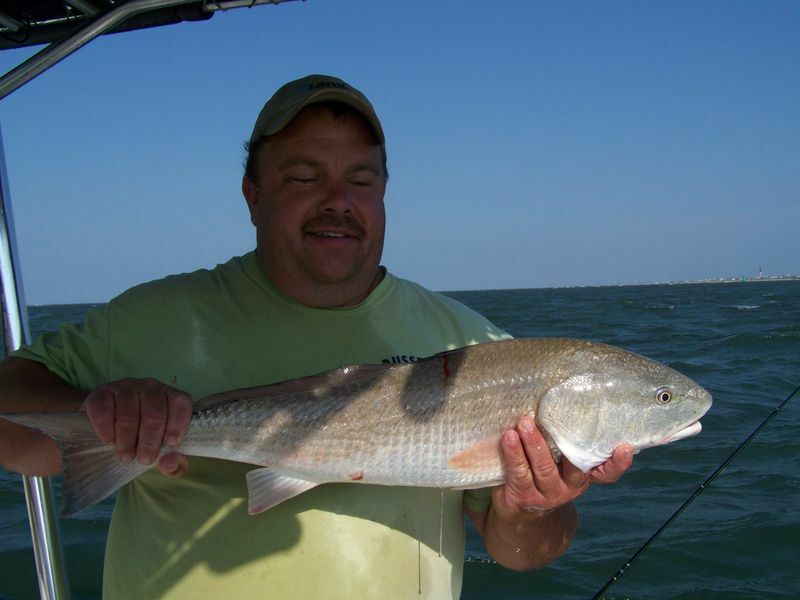 Oak Island Fishing Charters got into a hot Red Drum bite this morning. Even though the wind was blowing it was very nice in the backwater. 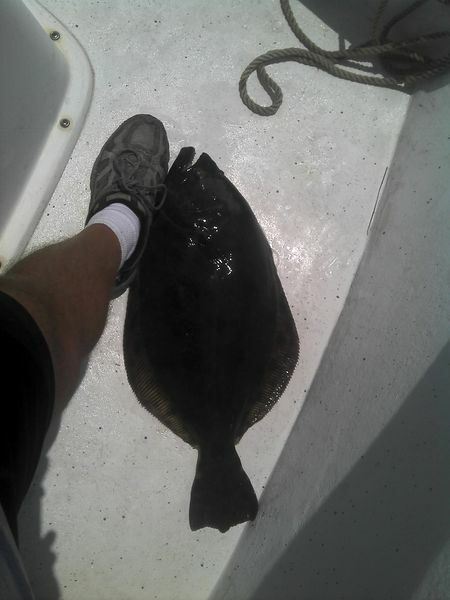 Toward the end of the trip we needed a flounder and on the last cast the inshore slam was complete. No big flounder today but the big red drum taking line off the reel was worth it. We let several fish go that did not fit into the slot. 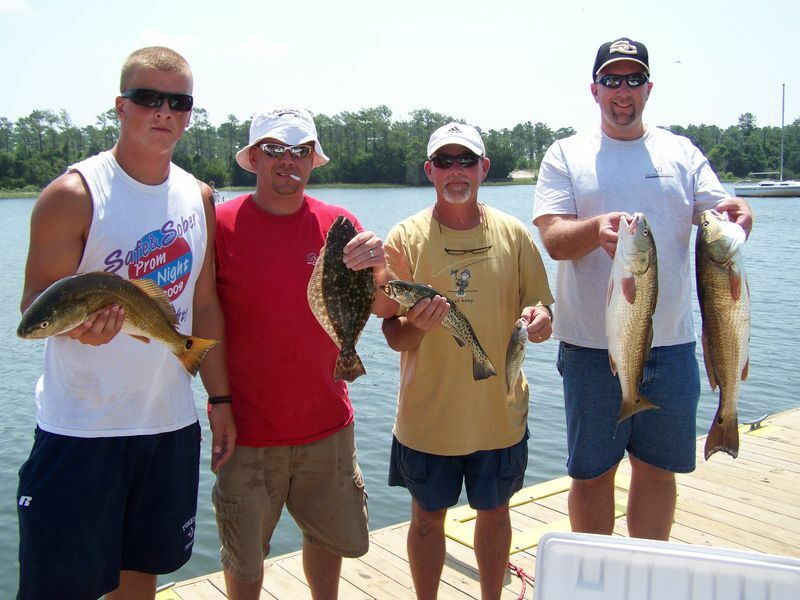 Today was a repeat of yesterday as we caught another BIG FLOUNDER and some Red Drum. We have not been catching a lot of fish like we should but we are making it up in big fish. Everyone is happy and has a fish story to tell. We did loose way to many fish today for what ever reason but tomorrow is a different day. Oak Island Fishing Charters was running a 1/2 day backwater flounder trip yesterday. 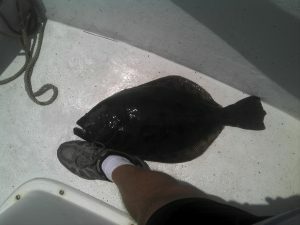 After a slow start we hit a mess of fish including this doormat behind Bald Head Island NC.